The Dialog for selecting how hight the bounty shall be comes up but the Next Button doesnt seem to have a link target and it happens nothing. hard reloading the page (ctrl+f5) as well as normal reloading the page (f5), nothing changes. logging out of the whole network closing down all pages, cleaning the cache, disabling all add-ons to no avail either. 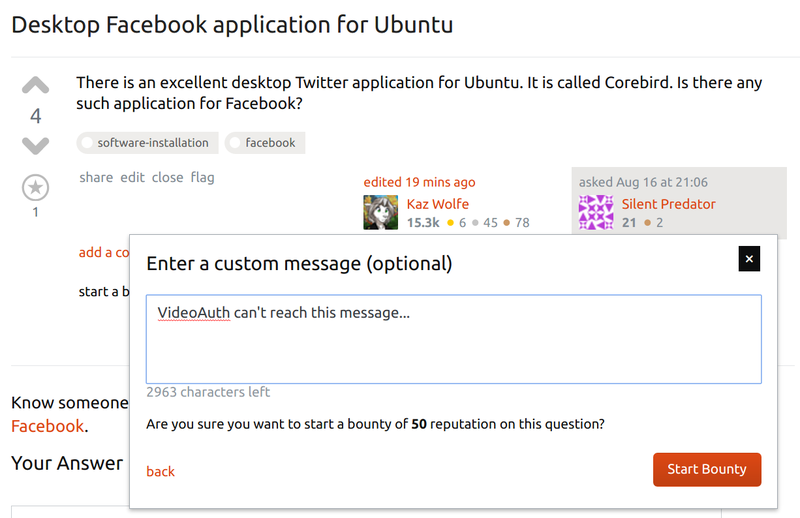 was able to put a bounty on the question via mobile firefox. tried another question then afterwards in browser on PC, again nothing. Is there currently a bug? Using firefox 50.1.0 - canonical 1.0.